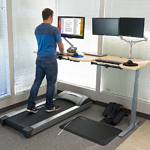 We took the FitDesk 2.0 into our labs and tested its performance as an office fitness machine. The results were underwhelming. We're skeptical about transplanting a stationary bike from the gym to the office. 30-day 100% money back guarantee and 3-year warranty for all moving parts except pedals. Customer is responsible for return shipping costs. 28" x 16" x 45"
Portable, able to fold up and wheel away when not in use. Has a robust cycling mechanism and 8 resistance settings. Non-slip desk surface and belt secure your laptop in place. Forces users into poor ergonomics, as do other bikes and bike desks. Small desk size and inability to customize monitor height and typing angle. Suited only for short bursts of exercise. The FitDesk, which has dubbed itself "The #1 Exercise Bike," attempts to bring the gym and office together, but it misses when it comes to long-duration workplace productivity. If you're in the market for an exercise machine that lets you check your email, you've found it. But anyone looking for a complete long-term, ergonomically-sound workstation (and a real desk) should think twice. Active workstations now sport under desk pedal units like desk cycles and desk ellipticals, which are less expensive and more ergonomically sound than their full-fledged stationary bike counterparts, improvements that make the old bike desks nearly obsolete. (Check out a comparison review of these products here.) But not all desk cyclers have moved on to greener pastures. There's still a niche market for the bike desk, especially among serious cycling enthusiasts who want to do a little work during heavy training season. We’ve written about our reservations on bike desks before, and approach them with no small amount of caution. Many users think of bike desks the same way they think of treadmill desks, but a bike desk lacks the automatic movement advantages of a low-intensity treadmill desk. Where a treadmill desk's automatic movement allows users to focus on work tasks, the bike desk's pedals require conscious effort to push forward, distracting them from what they are doing. Instead, users should treat bike desks like any other stationary bike: with the purpose of short-duration, high-intensity exercise. Among bike desks, one of the most prominent is the FitDesk 2.0 Bike Desk, which maintains much of its bicycle heritage but with an attached platform acting as a work surface. The second iteration of the FitDesk, this version improves upon the original with new, comfort-focused features. The main contender in a small but growing market, the FitDesk 2.0 was just the kind of bike desk we’d been itching to get our hands on. Our FitDesk cycle arrived in a long package shipped via UPS Ground and was a little haphazardly packed: some parts and components were enclosed in their own boxes or bubble wrapped, while others were left exposed. The metal components didn’t seem worse for the wear, except the foam around the arm rest, which had an unsightly gash. Assembly was pretty straightforward. The heavy mainframe was largely pre-assembled, and the only things we needed to attach were the feet, seat, and desk surface. The installation manual does a good job of navigating you through the variety of components involved in putting the FitDesk together. It’s simple though time-consuming; we found rigidly tightening every bolt quite tedious. Tools are included, but they proved less than ideal in a couple of steps—assembly will go much faster if you have your own set of ratcheting screwdrivers. The FitDesk 2.0 Bike Desk frame is a no-frills affair. Expanded, it measures 28" long, 16" wide, and 45" high, occupying as much space as a small desk. In photographs and from a distance, it looks flimsy, and some components—the desk attachment joints in particular—certainly have their share of instability. For the most part, however, the FitDesk is a solid machine with a smooth, silent pedaling experience. The leaf-shaped cycling assembly looks very similar to the one found on the DeskCycle. The FitDesk is a dense 47 pounds, brawny enough to confidently support users up to 250 pounds. For portability, you can fold it together and roll it along two wheels on its back leg, making it less obstructive than other stationary bicycles. 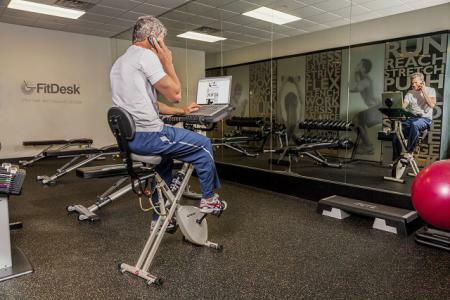 The FitDesk can accommodate most users between 4'10" and 6'. You can adjust the bicycle seat’s height and the desk surface’s depth. Unfortunately, there’s no way to change the height or angle of the platform, which would have been an ergonomic boon for the bike desk. The FitDesk takes some getting used to. The first obstacle many users will face is actually getting on it. The desk platform and bike frame get in the way of a smooth mount or dismount, especially if you're on the shorter end of the vertical endowment scale. If you’re wearing business attire with a FitDesk, you’re already off to a bad start. Flexible clothing, especially athletic wear, works best. Riding a FitDesk is a sweaty activity—not the same as walking on a treadmill desk. You wouldn't want to do it in dress shoes and the kind of clothes you send to dry cleaning. 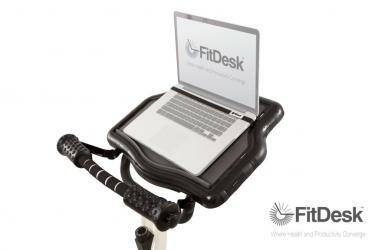 The FitDesk platform measures around 16" x 19"—wide enough for tablets and most laptops, but not much else. A mousepad attachment would be a significant improvement to the bike desk’s design. The platform is topped with a rubbery, non-slip surface to keep your laptop in place. Additionally, users have the option of strapping their computers down for added safety. Despite its initial shakiness during installation, we found the platform quite stable when weighed down with a laptop. A foam wrist rest protrudes from the front of the desk; this can be adjusted in angle or removed outright. Some testers liked having something soft to rest their wrists on, while others thought it was a nuisance that strained the shoulders. A handy drawer underneath the platform can store small things like a phone or TV remote, while the bike’s 8-setting tension-adjustment knob sits underneath the desk within easy reach. The meter, which displays your speed, distance, and time, among other things, is positioned towards the back of the platform. We’re a little puzzled by that, because setting your laptop on the desk blocks the meter from sight, thus creating an obstacle to positioning your computer. One of the main features of the DeskCycle is that it’s intended for use with a standard office seat so you’re able to pedal without sacrificing the comfort of your own chair. This convenience comes with a cost, however: standard chairs don’t offer an adequate range of motion for your legs. Users would have to set the DeskCycle far forward and pedal in an awkward and ergonomically harmful position. The FitDesk’s seat, by comparison, offers a greater range of motion and allows users to keep their legs at more ergonomic angles during cycling. A cushioned seat back helps straighten your posture somewhat. It’s not ideal; you’re still hunched over and still sitting. But its design is more suitable for pedaling than its under desk competitor. That said, anyone even remotely familiar with a bicycle seat knows that the FitDesk's is far from comfy. Despite the plush padding—certainly thicker than what you’d find on a racing cycle—it’s still a sore affair for your derriere. The FitDesk manual recommends that its users wear padded cycling shorts, though office dress codes rarely allow Tour-de-France fashion. Folks looking for a long-duration active workstation to use throughout the day should look elsewhere. 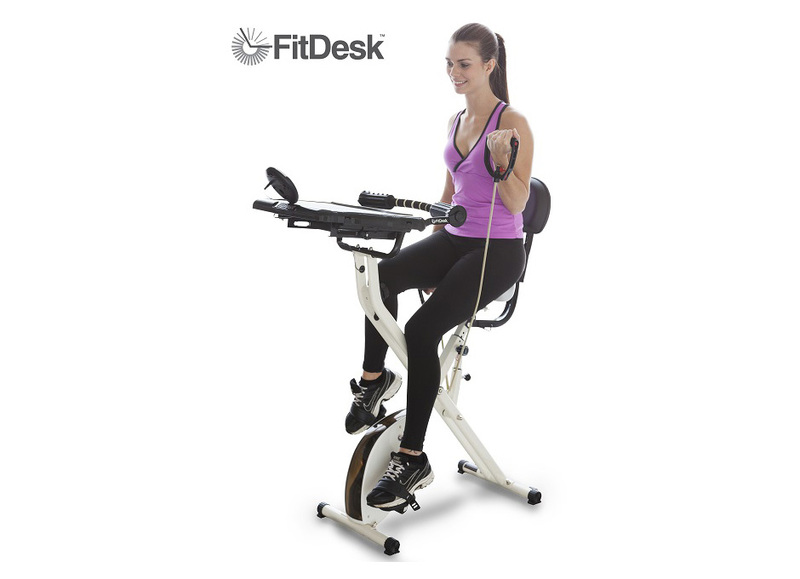 The FitDesk 2.0 Bike Desk, which calls itself “the #1 Rated Exercise Bike” and includes resistance bands for upper-body exercise, isn't designed for the level of multitasking that comes with a treadmill desk. Pedaling isn’t as automatic for most people as walking, and unlike a treadmill, where the belt is moving on its own, you only get some movement going on the FitDesk when you consciously make the effort to pedal. This makes all but the simplest tasks—answering emails or jotting down notes—a multitasking ordeal. Without sufficient concentration, your feet come to a standstill, and the FitDesk becomes nothing more than a cramped, uncomfortable sitting desk. We'd recommend office cyclists stick to less brain-intensive activities like catching up on videos. Rule of thumb: if you can't do it pedaling at the gym, you shouldn't do it on the FitDesk. That statement speaks to our main issue with the FitDesk 2.0 Bike Desk overall. It’s an exercise machine, not an all-day workstation, and users who try to stay on one for too long will encounter the whole suite of ergonomic maladies it presents. In the end, the FitDesk is no substitute for a standing desk or a treadmill desk, and it is not a NEAT device. If you're looking for some light NEAT movement, you would be better served going with a proper treadmill desk. We totally recognize that thousands of mini elliptical trainers and under desk cycles are sold each month, largely to cycling enthusiasts who want to keep working those quads while they're on the job. From an office fitness standpoint, there are some drawbacks to keep in mind, but one thing's for sure: The design of the product and the ergonomic setup of your workstation are paramount to success. If you haven't yet, check out our round-ups of Bike Desk Reviews, as well as the related Desk Cycle Reviews, before choosing the best product for your particular needs. While it still suffers from the same inherent flaws of all bike desks, the Flexispot Deskcise Pro is a solid all-in-one option. For kicks, our review staff created what we imagine is the world's first sit-stand-walk-pedal workstation. Check out the blog article on our Quad-Modal Office Fitness DreamStation. We integrated a Cubii with an iMovR Everest Dual-Tray desk, an iMovR ThermoTread GT office treadmill, a Tempo TreadTop Office Chair, and an EcoLast TreadTop Anti-Fatigue Mat to optimize movement during the workday. If you do end up deciding to invest in a cycling workstation, definitely check out our primer on How to Set Up an Ergonomically Proper Desk Cycle to ensure a successful experience. See our comprehensive Bike Desk Comparison Reviews. Note that under-desk cycles are included on our separate round-up of Desk Cycle Reviews. The name of this website is ‘workwhilewalking’. It is not ‘keepmovingwhiledoingthinkwork’ so one can understand if the editors are not in favor of a cycle-based desk unit rather than walking. Amazon.com logs over 1100 reviews for the FitDesk v2.0 Desk Exercise Bike with a relatively high 4.2 out 5 star rating. There are times when viewers rate a film much higher than the critics. This may be the case here as well. Having gone thru 20 years of various stationary and reclining bikes, I have found this to be excellent. I dont use it for 8 hours work, rather I use it for after hours…checking email etc. I pedal for 20-30 minutes at a time. The laptop stand suits me fine. I am 5’10” and have no problem with the ergonomics. Assembly was very simple and intuitive. The cycle is quiet. If you want to pedal 8 hours at a desk, perhaps you may want to look for a new line of work outdoors! I sit at a desk for hours editing photographs and purchased the FitDesk to add activity to my day. Overall I am very satisfied with my purchase. The bike is quiet and pedals smoothly. The seat height is adjustable. There are eight resistance settings if you need a challenge and the desktop is stable and well designed. There are extension leafs that can be purchased so that you have more ‘real estate’ to put your stuff on and the drawer is a nice touch. The only thing that is not so comfy is the bike seat but in all fairness, bike seats are never comfortable. I generally use the desk for 30 minutes at a time and come back to it for several sessions a day, alternating between it and my regular desk. Excellent buy for the price and I recommend it! Forgot to add that the desktop slides and can be pushed away from the center of the bike significantly to facilitate mounting and dismounting. 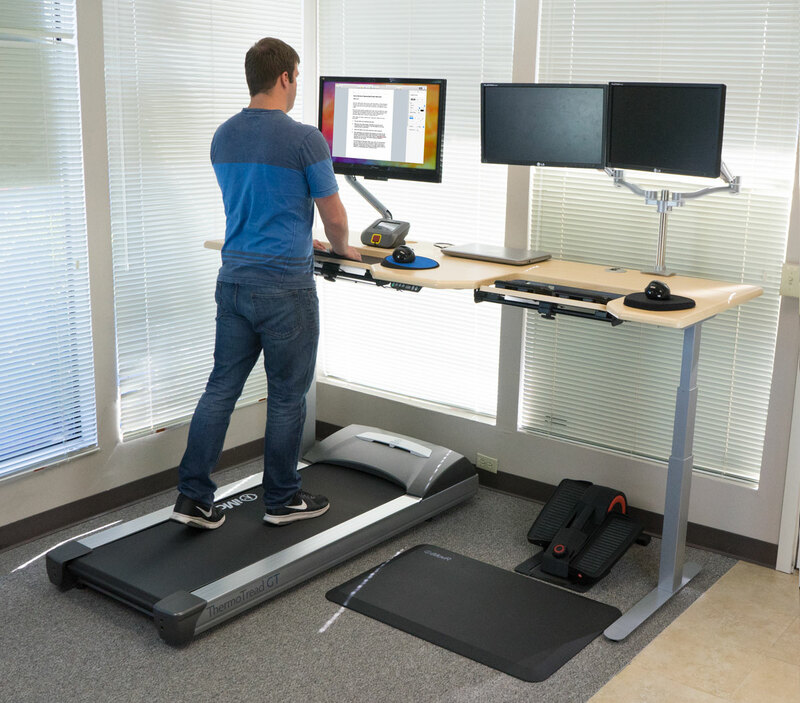 It’s a good alternative for people who can’t use a treadmill desk for some reason. If they developed one with better ergonomics I’d buy it.